Dr Sabina Mihelj is Senior Lecturer in Media, Communication and Culture in the Department of Social Sciences at Loughborough University, UK. She studied in Slovenia, Germany and Hungary and holds a PhD from the Ljubljana Graduate School of the Humanities. Her major areas of research interest include: nationalism and the mass media; religion, media and culture; the cultural Cold War; and comparative media research. She is currently working on a major Leverhulme Trust funded project investigating the relationships between popular television, social change and memory in socialist and post-socialist Eastern Europe. 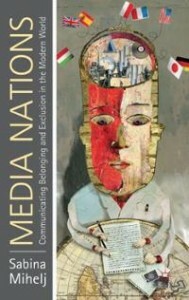 Media Nations provides an original interdisciplinary introduction to the study of the media and nationalism in the modern world, building on a range of case studies. The book also explores the relationship between media nations and processes of globalisation, and discusses how mediated nationalism relates to gender, memory, war and cosmopolitanism. a. What is the relevance of nationalism and national identity in understanding the global patterns of mediated communication and identification? b. How is national imagination shaped by the institutional structures of modern media and the broader political and economic context? c. How can we overcome the tacit ethnocentrism of existing debates, and understand the wide variety of modern forms of mediated nationalism around the globe? To answer these questions, I have first provided a critical revision of established concepts and approaches, including Benedict Anderson’s Imagined Communities (1983), and then developed an alternative approach to nationalism and mass communication, which combines the understanding of nationalism as a form of discourse with an emphasis on its link with power and politics. In the second step, I have built on theories of multiple modernities to develop an analytical framework that is capable of accounting for the diversity of nation-building processes around the world. The remainder of the book applies this framework to a range of case studies and links it with issues of gender, war, memory and cosmopolitanism. c) a wealth of case studies from countries as diverse as China, South Africa and India. Media Nations is the first book in over twenty years to propose a new general theory of the relationship between nationalism and mass communication. It offers an analytical approach that bridges the gap between textual analysis of national imagination and the more sociological concerns with the impact of media institutions and the broader political and economic context. Most importantly, Media Nations also challenges the tacit ethnocentrism of existing debates, and opens up the study of nationalism and mass communication to the multiple trajectories of modernity around the globe. The book combines my interests in sociology, history and the media. The choice of nationalism as the key topic was inspired by my personal experiences with the Yugoslav Wars. Of particular relevance to contemporary developments would be a further analysis of national imagination centred on consumption, which I believe is the prevailing form of mediated nationalism today. I can also see several potentially fruitful links between this and the emerging literature on nation branding. More generally I would hope that other researchers will seek to apply my proposed analytical framework to other case studies, both historical and contemporary. South American media nations would provide a particularly interesting testing ground.